Everybody knows the popular American film of 1940s which had become the classics of cinematography already - Casablanca. One of its characters - Rick- can also be called as a famous roulette bettor who used the principle of biased wheel to help one person with winning. Who was Rick and what his roulette bet was special for? Continue reading if you are interested in getting more. Rick is the owner of Café Americain where it is possible to find a trick roulette wheel; the croupier of this wheel can make it landing on number 22 always. Rick knows that and one day he helps the Bulgarian emigrant to win roulette by using this fact: he asks the croupier to help this man with winning and tells the emigrant to bet his last three roulette chips on 22. 22 wins of course and Rick tells the man to bet the whole winning on 22 again and lets him win one more time! The winning was 3885 francs! Not bad for those times, is not it? The role of Rick had been played by a popular American actor - Humphrey Bogart who had been nominated for Casablanca in 1944. Here is the list of the main events which happened in his life. 1899, 25th of December: the date of birth (New York, California). 1920-1922: he manages the company of his family's friend after he was expelled from Phillips Academy in Massachusetts (he was sent there to prepare for studies at Yale). This period is commemorated also by Bogart's stage performances. 1930: Humphrey Bogart gains the contract with Fox and in 5 years he begins to get main roles in different films and becomes popular. 1947: forms his production company. 1952: had been awarded for the role in The African Queen.Won Oscar. 1955: nominated for The Caine Munity. 1957, 14th of January: passed away because of throat cancer. 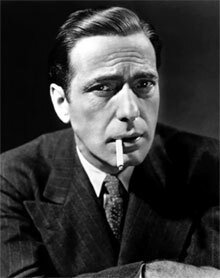 Humphrey Bogart had played in about 80 roles in different films (years 1928-1956). To know more about his life you are welcome to read the whole biography of this wonderful actor.